Stephanie graduated from Northeastern University with a Doctorate in Physical Therapy in 2010. She joined Ivy Rehab immediately after graduation and has been with the company ever since. She has been the director of the Hoboken location since 2016. Her interest in physical therapy, anatomy, and working with athletes developed over the course of many years as a gymnast. More recently, she became a Pose Certified Running Technique Specialist and has helped countless runners complete races, recover from injuries, and improve technique. She is the head of Ivy Rehab's clinical running program and teaches other therapists how to perform video gait analyses and provide optimal evaluation and treatment of runners utilizing the most current research. Julie graduated from Upstate Medical University with a Doctorate in Physical Therapy in 2014. After doing some traveling she joined Ivy Rehab in January 2015 and has been with the company ever since. She is a staff physical therapist at he Hoboken location. Her interest in physical therapy, anatomy, and working with athletes developed over the course of many years as a dancer, cheerleader and health/gym enthusiast. She enjoys working with all types of patients including athletes to pediatrics. She is self-described as outgoing and personable. Kevin is a board certified, Doctor of Physical Therapy, who graduated from the University of Scranton with his B.S in Biology in 2011, and his DPT in 2014. He is also in charge of the golf rehabilitation program at Ivy Rehab in Hoboken, NJ. This program is designed for injured golfers to get back to the course as quickly and efficiently as possible. Since graduation, Kevin has been working in the outpatient orthopedic setting using a combination approach of manual therapy and therapeutic exercise, which allows his patients to optimally return to, or exceed their prior level of function. Kevin is a life long athlete who grew up playing hockey and golf and has studied extensively with the Titleist Performance Institute (TPI) for golf rehabilitation/ performance, the Mulligan Institute, the Maitland approach, and the SFMA. 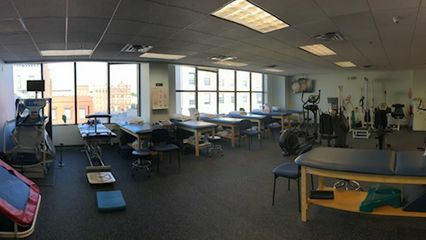 If you are an athlete looking to return to their sport (particularly golf), looking to return to the gym, or just looking to live life pain-free come see Kevin at Ivy Rehab in Hoboken, NJ.